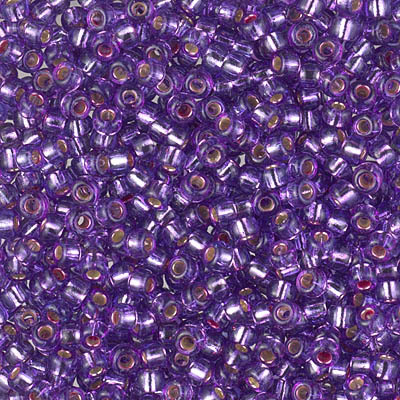 Soft Flex® Extreme Wire is the world's first eco-friendly beading wire. Soft Flex® Extreme Wire is a beading wire free of heavy metals for designers that want to add sparkle and shine to a piece that exposes the wire. This wire will not tarnish. Constructed of 1x19 micro woven metal alloy wires, it is supple enough that it can be knotted. Great for those who want to be 'green' and desire a high quality wire that will allow for a number of applications -- this is fairly easy to knit with and will hold up extremely well. We offer two choices from this web page. 1. One Extreme Flex 24k Gold 10 foot spool, 0.14mm diameter. This gives you the chance to try this wire. We brought in the thinnest diameter for the gold spool: .014. 2. 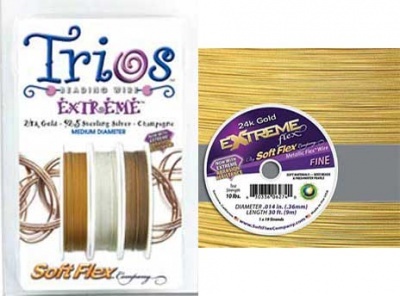 Trios: three 10 foot spools, one in 24k Gold, one in 92.5m Sterling silver, one in Champagne. (The Champagne is a bit deeper and less yellow than the gold.) These are the medium diameter, 0.19mm and compares to the diameter wire we had in the past on our wire bracelets that used Flex-rite wire. Sorry - the Trio is out of stock. This is a great deal if you would like to have three great colors of wire for jewelry making.